Removing privacy filters from monitors where on-screen data must be protected can be a serious violation. In medical, library, financial or other facilities that require secure data, the PrivateVue monitor is the perfect solution. The permanently installed Privacy Filter prevents filter removal and keeps you compliant. 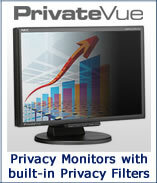 Want to supply your own monitors and/or privacy filters? No problem! We can provide filter and integration services only. Just choose one of our "Filter and Integration" parts or the "Integration Only" part. CLICK for more details.